Standard First Aid w/CPR/AED (6 ½ hours)-Our most comprehensive training course for lay-rescuers, this course provides training in first aid, adult CPR and use of an AED. Standard First Aid w/Adult CPR (5 ½ hours)-This course provides first aid, and adult CPR training and explains the role of AED's in emergency cardiac care. 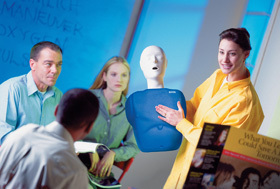 First Aid (3 ½ hours)-Participants learn first aid skills for treating a variety of injuries and illnesses. Includes burns and bleeding injuries; sudden illnesses such as strokes, seizures and shock; Activation of the Emergency Response Plan, Cardiac Chain of Survival and use of Personal Protective Equipment (PPE's) are also reviewed. Adult CPR/AED (4 hours)-Participants learn adult CPR and AED skills to respond to breathing and cardiac emergencies. Adult CPR (3 hours)-For individuals who need adult CPR training only, this course also reviews the role of AED's in emergency cardiac care. Child/Infant CPR (3 ½ hours)-Ideal for teachers and daycare workers, this course prepares for participants to respond to breathing and cardiac emergencies in infants and children. Child AED may also be added. AED (1 ½ hours)-AED is training is available as an add-on to both adult CPR and child CPR training. May also be taken by anyone possessing a current CPR certification. Participants learn how to use an AED on adult victims of cardiac arrest or child victims of sudden cardiac arrest between the ages of 1 and 8. Bloodborne Pathogens-Preventing Disease Transmission (2 hours)- This OSHA approved program discusses how diseases are spread, how to prevent exposure and what to do if an exposure occurs. The following Injury-Control Modules (1 hour each) can be added to any of the above-mentioned classes to customize a class to meet your specific needs. These awareness-building modules include Participant booklets that highlight risks and promote prevention. Healthcare Provider BLS (6 hours)-This American Heart Association course is ideal for any healthcare provider, including nurses, dental hygienists, EMS and other professionals who have a duty to respond or are required to be CPR certified. Includes adult, child & infant CPR; use of an AED and use of various resuscitation devices. Training in Preventive Strategies (TIPS) Alcohol Awareness Training- This five hour course (six in Illinois) is ideal for any person that serves or sells alcohol. This nationally recognized program offers participants ways to identify and address potentially dangerous situations involving alcohol before they occur. Remember, drunk driving isn't the problem, drunkenness is. This course has been used successfully in the court of law as a "reasonable effort" that businesses can take to minimize or eliminate potential problems that may occur while serving or selling alcohol.